Martin Truex Jr #78 Bass Pro Shops 2017 Monster Energy NASCAR Cup Champion Jacket, by JH Design. Martin Truex Jr NASCAR Champion brushed cotton twill adult uniform jacket with embroidered sponsor graphics, satin lining and snap-button closure. 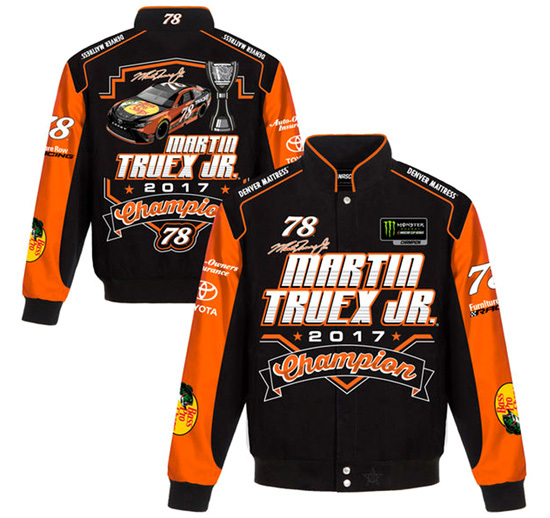 The Martin Truex Jr NASCAR Champ jacket features a crew neck collar and rib-knit cuffs. JH Jacket sizes run slightly larger than average.